One of my favorite aspects of the holiday season is the abundance of sweet treats. It seems like everywhere you turn someone is offering you a homemade cookie or at the very least, a candy cane. The only problem is, I get tired of the same old frosted sugar cookies by mid-December. That’s why I think it’s fun to make some different treats that you won’t see everywhere else. 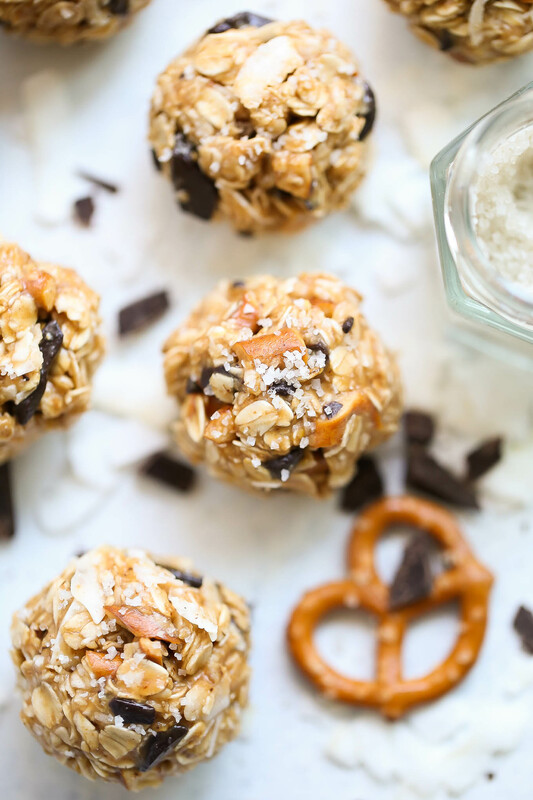 These Coconut Chocolate Pretzel Balls featuring Quaker Old Fashioned Oats are a great alternative. 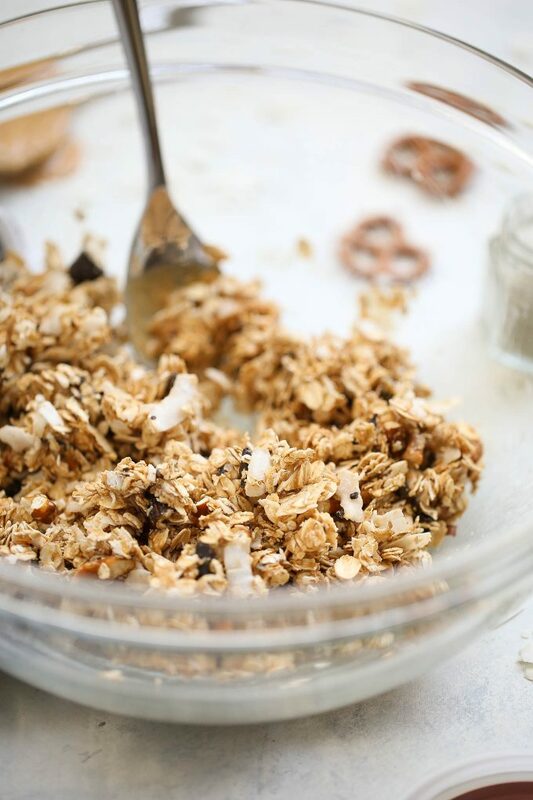 Since oats have 100% whole grain, a serving provides a good source of fiber, which is why I love cooking with them. 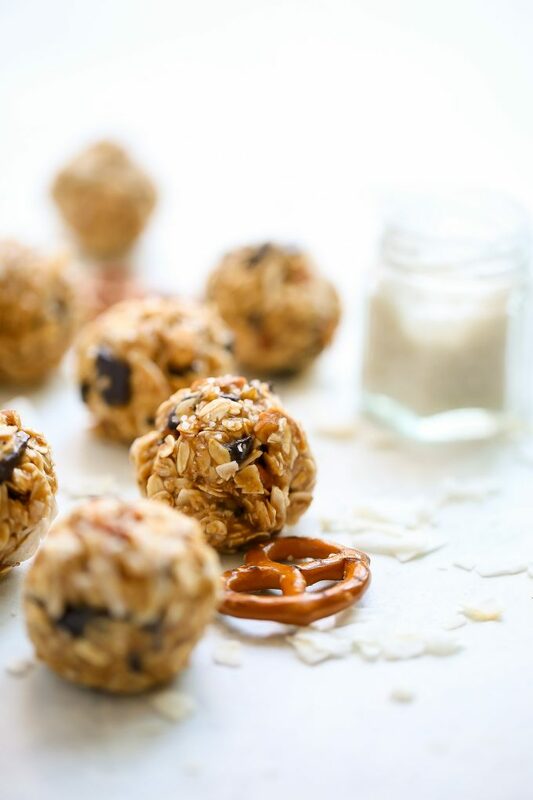 They’re easy to make and require no baking! 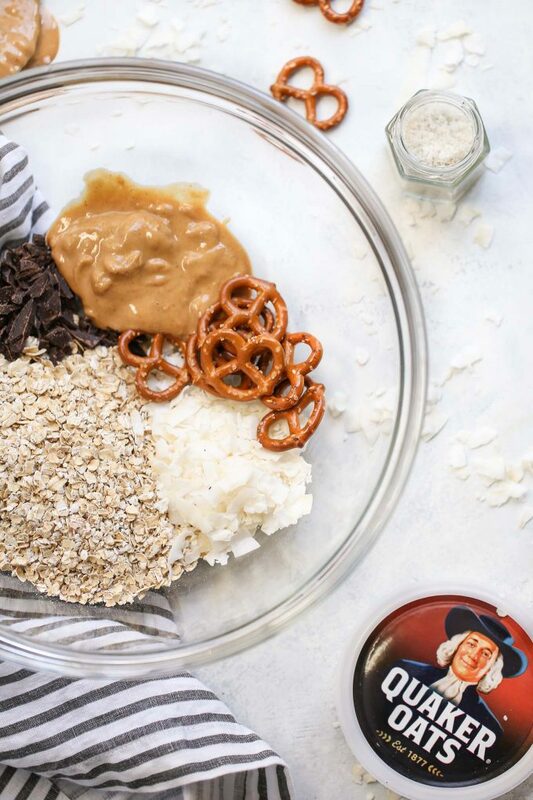 Chocolate and coconut are a classic pairing, the oat base provides a nice chewy texture, and the pretzels and peanut butter add that extra delicious, salty component. They’re sweet, salty, and a great poppable treat this season! In a large bowl, combine all ingredients and mix well. Refrigerate for 30 minutes. Wet your hands and roll the dough into 24 balls. Refrigerate until ready to serve. Leftovers can be stored, covered, in the refrigerator for up to 5 days. If needed, add 2 tablespoons melted coconut oil to the dough to help it stick together. I love the fact that these are different. As you said, we seem to see the same treats time and time again this season. That gets old quickly, even for the ones that are very enjoyable. It looks so yummy! What a unique recipe! Perfect foe desserts. This sounds delicious. Now I know what to do with the bag of pretzels that I was going to throw out. Thanks!